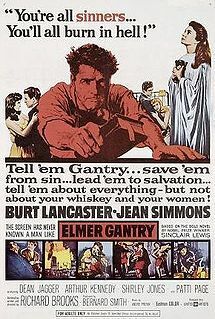 Elmer Gantry is a 1960 drama film about a con man and a female evangelist selling religion to small town America. Adapted by director Richard Brooks, the film is based on the 1927 novel by Sinclair Lewis and stars Burt Lancaster and Jean Simmons. The movie presents fewer than 100 pages of the novel, deleting many characters and fundamentally changing the character and actions of female evangelist Sharon Falconer, played by Simmons. The story's use of a female evangelist bears a resemblance to true-life Sister Aimee Semple McPherson. The film won numerous awards.